Taste test: These are good kettle-style chips. They're thick and crunchy and have a nice, mild garlic taste. 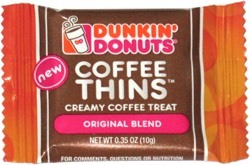 I don't have a sandwich on hand right now, but these seem like the kind of chips that would go great with a sandwich. From the package: “In a Tuscan Osteria, a meal may include oven roasted potatoes cooked with herbs and garlic. In our home, this dish makes us long for a trip to Italy where the use of herbs and garlic is a natural part of everyday life. Our Herb & Garlic recipe takes a page from Tuscan cooking with a perfect balance of roasted garlic, rosemary and other aromatic herbs combined to stimulate your taste buds and other senses. 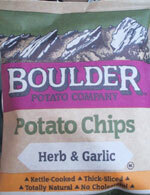 Like all Boulder chips, our Herb & Garlic chips are kettle-cooked in small batches using high monounsaturated sunflower and/or safflower oil, which are both extremely low in saturated fat. We hope our natural rendition of this traditional combination of vinegar and potatoes is the best you'll ever taste!